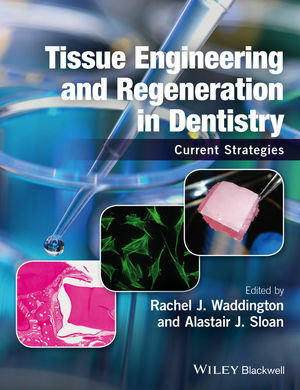 Tissue Engineering and Regeneration in Dentistry: Current Strategies presents a thorough update on the current advances, methods and understanding in tissue engineering in dentistry. It offers invaluable tools, case studies, and methodologies for undertaking research, including important biological and practical considerations to facilitate successful migration of research from the bench to the clinic. Rachel J. Waddington is Professor in Oral Biochemistry and current Associate Dean for Engagement and Enterprise at the School of Dentistry, Cardiff University, UK. Her research interests centre on the cellular and matrix biology of bone and dentine and applying this research to improved diagnosis, management, and treatment in clinical dentistry, with crossover to orthopaedic medicine. She has published more than 80 papers in peer-reviewed journals, and supervised over 20 PhD students. During her career Rachel has been awarded the Senior Colgate Prize (1990) and the Mineralised Tissue Group Travel Award (1996), both awarded by the British Society for Oral and Dental Research (BSODR), and a Royal Society overseas study award. She is an active member of the BSODR, currently sitting on the Management Committee as Chair of the Awards Committee. Alastair J. Sloan is Professor in Bone Biology and Tissue Engineering and current Vice-Dean of Research and International at the School of Dentistry, Cardiff University, UK. His research focuses on the repair and regeneration of mineralized tissues and the behaviour and therapeutic use of dental pulp stem cells. His research has been widely published in peer-reviewed journals. Alastair currently sits on the Management Committee of the British Society for Oral and Dental Research (BSODR) and the Board of the Tissue and Cell Engineering Society UK (TCES), and is Chair of the Cardiff Institute of Tissue Engineering and Repair (CITER). In 2011 Alastair was awarded the International Association for Dental Research Distinguished Scientist – Young Investigator Award.